I am so excited for tomorrow. Joe managed to get the entire day off. We originally planned on a Mother’s Day Brunch at a local restaurant overlooking the Hudson River. Unfortunately, the restaurant was booked two weeks in advance. So instead of gorging ourselves on overpriced food I am running my first 5K of the season and Riley is running her first ever 100 yard dash. I am so excited for Riley. We went and picked out running shoes this afternoon for her. She was so funny in the store running up and down the aisles showing the salesperson how fast she is. I am so thankful for a day that celebrates a large part of who I am. I love being a mother. Riley makes each and every day interesting and she teaches me so much. In order to indulge myself a little bit after my 5K, I whipped up some Oreo Truffles for dessert. These were so simple to make and they are delicious! Place the entire package of oreos into a food processor and crush to a fine consistency. Add to the cookie crumbs the package of cream cheese and hand mix until it becomes a dough like consistency. Form round balls of the dough and place on a wax paper lined cookie sheet. Place the cookie sheet in the freezer for at least an hour. The longer the better. Melt half of the chocolate and drop the balls into the melted chocolate. Roll the balls in the chocolate and place back on the wax sheet so that it dries. This should coat about half of the balls. Melt half of the pink candies and drop the rest of the balls in to coat. Place these balls on the wax paper and let these dry. 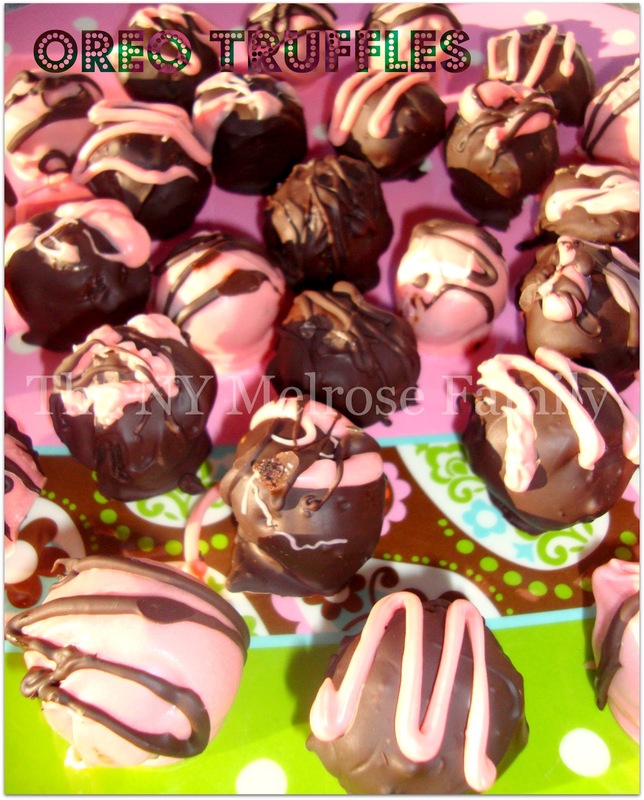 Melt the rest of the chocolate and the pink candies and place into a pastry bag to give the dried chocolate balls a design on top. Good luck to you on your 5k and good luck to Riley! Happy mothers day, and I love these truffles! Happy Mother's Day and good luck tomorrow!! My first race of the season is next weekend:) Can't wait! Oh, those look super yummy. YUMM! I'm going to have to try these! They sound delicious and they look pretty too! Great job running your 5K! I love love Oreo truffles! Your looks so tasty. Thanks so much for sharing on Tout It Tuesday! OMG – i would consider getting back into running just to taste these babies. Mmmm. Good luck with the run. Thanks for sharing your oreo truffles at our party this week. Those sound so good! I pinned it to make over the summer. I would love it if you would link this up to my linky party at http://www.firehousecrafts.com/whats-hot-in-the-firehouse-linky-party-1/. Hope to see you there! Ok, those just look fabulous! I'm going to have to try this reciepe! These look AMAZING! I'm sitting here wondering how many Oreos are left in the package I purchased this week! I'm originally from Queens! Love a fellow New Yorker's Blog! Following! Enjoy your weekend! Thank you so much for sharing your truffles on Dare to Share. I am pinning them to my sweet treat board. These truffles look really good. I hope that your 5K went well. Thanks for sharing at Showcase Your Talent Thursday! Wow these sound super good! I'm pinning it for sure! Yummy! They are so pretty too! Thanks so much for sharing at Mom On Timeout! Those sound delicious!! Thank you for sharing them at Sharing Saturday!! I hope you are having a wonderful week!! I simply want to mention I am newbie to blogging and site-building and truly enjoyed your blog. Almost certainly I’m likely to bookmark your site . You amazingly come with good writings. Many thanks for revealing your blog site. I used to be recommended this website via my cousin. I’m not certain whether this put up is written through him as nobody else know such exact about my trouble. You are wonderful! Thanks! I love truffles! These look amazing!